Meat is a global product, which is traded between regions, countries and continents. The onus is on producers, manufacturers, transporters and retailers to ensure that an ever-demanding consumer receives a top quality product that is free from contamination. With such a dynamic product and market place, new innovative ways to process, package and assess meat products are being developed. With ever increasing competition and tighter cost margins, industry has shown willingness to engage in seeking novel innovative ways of processing, packaging and assessing meat products while maintaining quality and safety attributes. This book provides a comprehensive overview on the application of novel processing techniques. 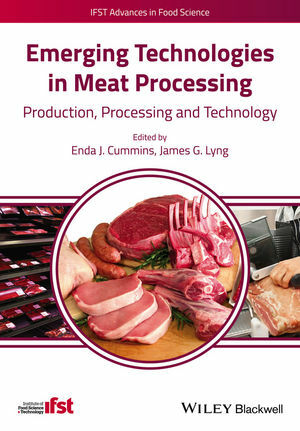 It represents a standard reference book on novel processing, packaging and assessment methods of meat and meat products. It is part of the IFST Advances in Food Science book series. Dr. Enda Cummins (BAgrSc MEngSc PhD) has worked in University College Dublin since completing his PhD in 2004. He has extensive experience with regard to food processing, food safety and risk assessment and has been involved in the safety evaluation of new technologies for use in the food industry. He has managed a number of research projects in relation to food safety, processing effects and traceability of foodstuffs. He lectures undergraduate and postgraduate courses in Product development, Food Physics (including novel processing and packaging techniques) and also in the area of Food Safety and Quantitative risk assessment. Dr Cummins is also the programme coordinator for the postgraduate Masters programme in Food Engineering (MEngSc) in the College of Engineering within UCD. He has published extensively in the area of food safety, including meat safety and quality aspects. Dr. James Lyng (BAgrSc PhD) is based at University College Dublin, and is a food scientist with extensive experience in the use of novel technologies for processing food and their impact on food quality and also the measurement of physical properties of foods which govern interaction between these technologies and the food product. He obtained his PhD degree in meat processing using high intensity low frequency ultrasound. Since 1997 Dr. Lyng has been a UCD lecturer delivering courses in Food Process Technology, Food Engineering and Food Physics. Dr. Lyng has an extensive range of publications in the measurement of electrical conductivity and dielectric properties which are both physical properties relevant to some of the technologies which will be covered in the proposed book.